From your dashboard, click "Schedule" and land on on your Calendar. There you'll see a 'Configure Services' button... click it! You'll first need to fill in some general settings (location options, your phone number, preferred currency, and any some general notes about your private services). Next, set up your availability for the week. You can add more than one time slot for the same day by clicking the "+" icon. Create different packages to describe what you can offer to clients. For each package, fill the description, price and duration. You can add as many packages as you like. Simply click 'Add Another Package' to add more. Once you're done, make sure to click 'Save'. Safety. With advance credit card payment, the identity of any new clients is firmly established before you meet them, so the risks involved with meeting strangers are virtually eliminated. When a yogi from your list of students books an appointment with you, you're paid out the full booking amount minus a 7% Platform Fee, (and minus the 3% processing fee). Existing students are identified by their email address (matching that of someone on your students list for any of the profiles you manage). 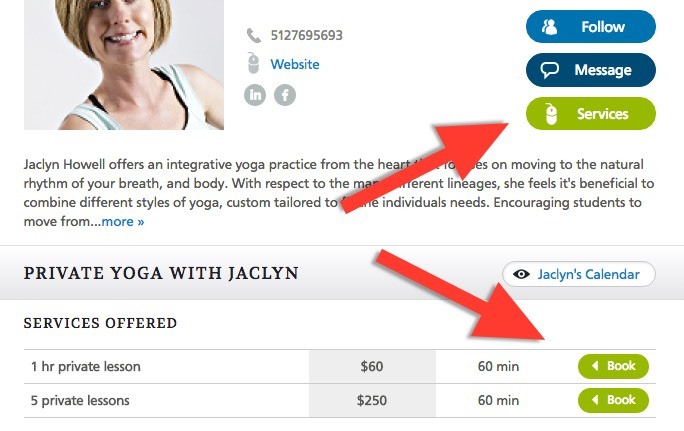 If a new client books with you, YogaTrail collects a 7% "finder's fee" as our reward for connecting you with a brand new client. This is only for the first-time appointments or purchases. After booking, this new client becomes your student, of course. So, you only pay a 14% commission when you get a brand new client from YogaTrail, and only on their first appointment.